Rick Thurman opened his morning lecture - or rather, conversation - with this simple statement, asking the audience what they thought it meant. He explained his statement to the auditorium filled with students, faculty, and staff: you will either be fired up and enthusiastic about what you're doing, or you won't be doing it for very long. Thurman, an EKU alumnus ('78, broadcasting), has more than thirty years of experience in sales, sales management, media, and sports marketing, and is the owner of Thurman Media Group in Sarasota, Fl. 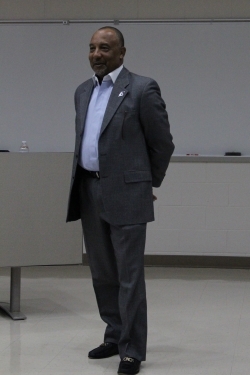 Addressing an auditorium full of business students, Thurman briefly explained how a broadcasting student such as himself became a successful businessman in the sales industry, then proceeded to take questions and carry a conversation with students regarding their future career goals and life decisions. He told the students, "sales is a business of persistency, drive, and enthusiasm," and that while some of them may not graduate with much work experience, their willingness to succeed, grow, and learn will overshadow lack of experience in the eyes of a potential employer. Thurman received many questions regarding his experience, as well as his opinion on managing a sales career, starting a company, work-life balance, and staying motivated. He provided students with a perspective built from experience and the drive to succeed. He encouraged students to make decisions about their priorities and to build their actions around those decisions, noting that as life changes those decisions may change, but to always drive toward success in what they decide is important to them. Thurman spent the afternoon and the following morning visiting with students and faculty in class and the Center for Professional Sales.